As of January 1, 2019, none of my products may be used in commercial scrap for hire/scrap for others endeavors. This change is not retroactive and only applies to products sold after the 1st of January. I have two Professional Use licensing options available in my shops at PBP - one for single product use and one for 12-month use. 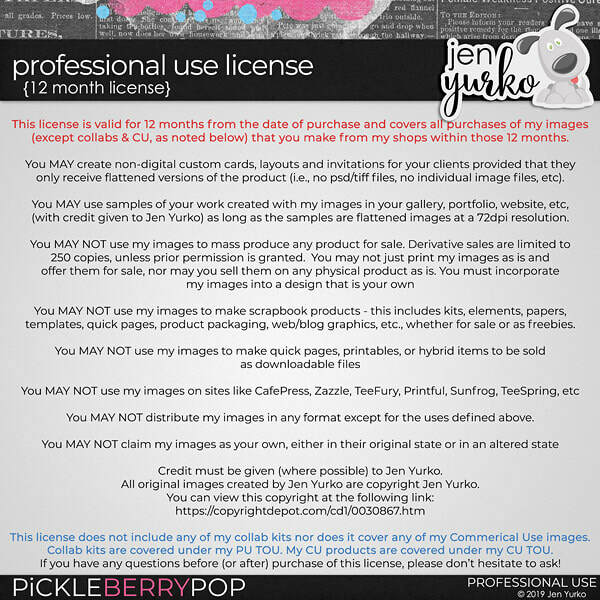 Please read these licensing terms before purchasing! Products may not be reproduced for sale or redistribution in any way. You can recolor, resize, and/or alter the designs for your own scrapbook pages & projects, including hybrid and paper scrapping. You can post your pages/layouts/projects to online blogs, galleries and to your website - no credit is required, but is appreciated. You can submit your pages/layouts/projects for print publication. Please credit Jen Yurko at jenyurko.weebly.com. You cannot claim my designs as your own, altered or not. You cannot redistribute my designs in any way - this includes: file sharing sites like 4shared, rapidshare, box.net, mediafire, onedrive, etc; uploading to your own website for download; email; CD/DVD/USB devices; etc. You cannot use my designs on sites like cafepress, zazzle, shutterfly, etc. You cannot use my designs to create digital brushes, shapes or tubes for resale. You cannot create/offer quickpages, blog designs, etc for sale or free. You may not create a blog design, logo, brand, website design, web page design, blinkies, banners or advertising/promotional images for yourself or your client(s). You cannot create/offer freebies using my designs without express written permission. ​Credit is appreciated but not required. You can create items in your (personal use) digital kits for sale. You can recolor, resize, and/or alter the designs to suit your needs. You cannot use my products to create commercial use products. You cannot resell my products "as is". They must be altered in such a way that the original product cannot be extracted from your product. You cannot use my products by themselves to create, for example, an element pack, where my design is simply recolored and repackaged. You must incorporate your own design with it. You cannot claim my designs as your own, whether altered or unaltered. You cannot redistribute my designs "as is" in any way - this includes: file sharing sites like 4shared, rapidshare, box.net, mediafire, onedrive, etc; uploading to your own website for download; email; CD/DVD/USB devices; etc. You cannot create/offer freebies using my designs unless they are incorporated into your personal use products for sale and/or part of a promotional or advertising campaign. For example, you created a kit with matching quick pages & incorporated my designs in both. You MAY give the quick pages away for free to help promote your kit or give the kit free in a random draw or giveaway. You MAY NOT create a product with my designs with the sole purpose of giving it away for free. ​None of my personal products may be used to make blinkies, banners, blog designs, store designs, site designs, logos, brands or any other kind of graphics to be displayed on the web. Commercial use products may be used for the above stated purposes after paying an additional licensing fee. If you are interested in purchasing additional licensing, please contact me for details. All of my original doodled designs are under copyright protection. To view this copyright you can click on the image below.